Clothing and hairstyles are expensive. Also, I always wondered where Pokecenters got their funding. Turns out they have a complete monopoly on everything you and your pokemon could ever need! Of COURSE you’re gonna go in and get all healed up. Might as well grab some Paralyze Heals and a new hat while you’re at it. Genius. Is Meowth in the game? I don’t know. Oddish is, so that’s pretty cool. This entry was posted on Monday, October 14th, 2013 at 12:00 am and is filed under Comics. You can follow any responses to this entry through the RSS 2.0 feed. Both comments and pings are currently closed. Bulbasaurs are a more fiscally responsible starter. Well, Meowth learns Pay Day. 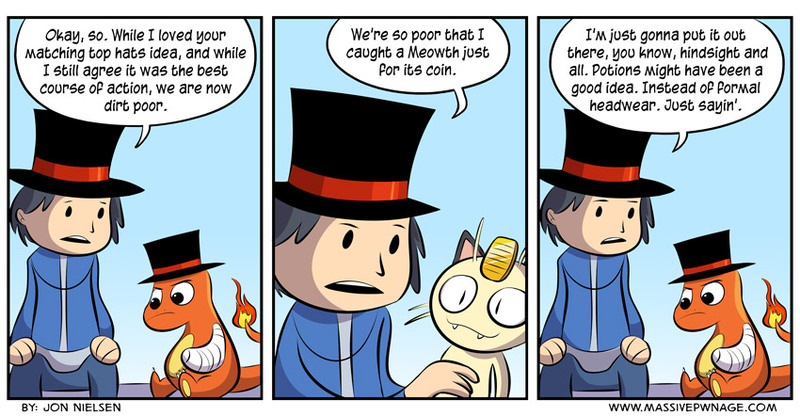 It’s more fiscally responsible to have a meowth with pay day and the amulet coin. Or just anyone with amulet coin really, the children aren’t even remotely short of lunch money to steal. When they introduced rebottling I would fight the rich kids over and over.